Motocaddy’s new M Series comprises four car-boot friendly power trolleys that boast a host of useful features and industry firsts. 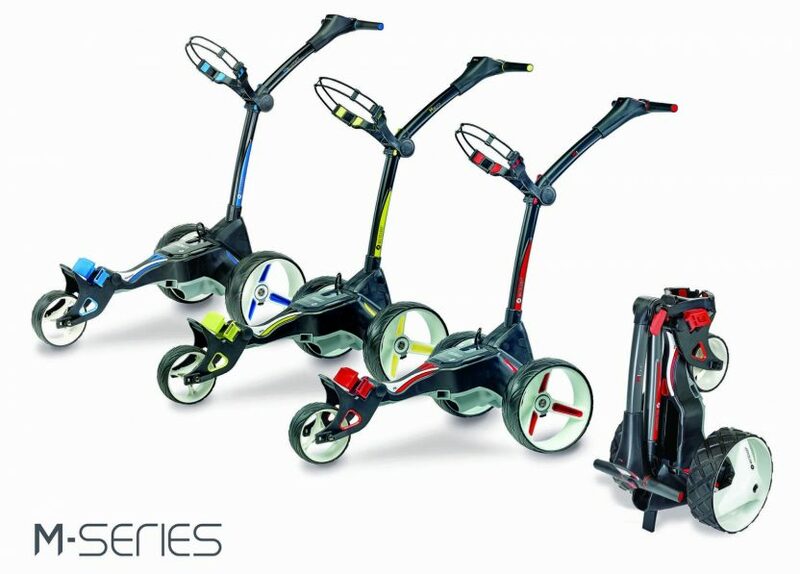 On sale now, the new M Series range offers space-saving inverted wheels, new lightweight and powerful lithium batteries, and includes the world’s first GPS enabled compact-folding model. All four models are powered by a new 28V system that runs at a significantly higher voltage than traditional trolleys. The upgraded voltage allows the trolleys to operate more efficiently, meaning they don’t have to work as hard to perform the same task as the 12V systems found in most other electric trolleys. 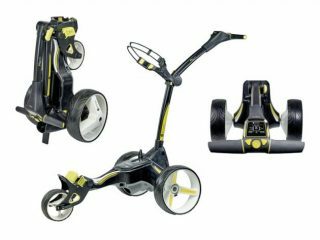 A new lithium battery, which is available in standard or extended options, is 33% smaller than previous models, while the trolley itself folds down to a size, that, according to Motocaddy, is 11% smaller than any other trolley on the market. 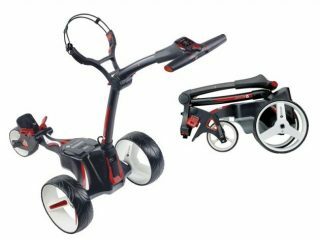 Other features shared across all four models include height-adjustable handles, an auto-open stand mechanism, and Motocaddy’s unique bag-to-trolley connection system, which removes the need for a lower bag strap. 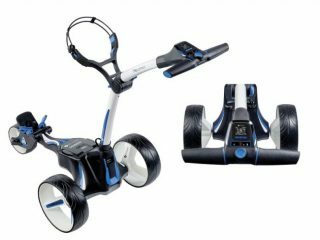 The top-of-the-range model is the M5 Connect ‘Smart Cart’, which boasts a built-in GPS system and smartphone notifications. As with the S5 Connect, the M5 uses Bluetooth to sync to the free Motocaddy GPS app and display front, middle and back distances on a digital display housed in the handle. The new M3 Pro is simple to set up and includes three distance measurements (Drive, Round and Life); a USB charging port; and a high resolution LCD colour screen. Other features include six-step adjustable distance xontrol (up to 60 yards); a CartLock security pin code; advanced battery meter; a clock, and round timer plus nine speed settings. The M1 also incorporates an LCD high-resolution colour screen, nine speed settings and a battery meter, while the new M1 DHC offer the same features as the M1 with the additions of all-terrain wheels, and a downhill braking system which enables it to maintain a constant speed while moving down a slope, coupled with an electronic parking brake. M5 Connect (black or white frame with blue trim) £599.99/£649.99 (standard/extended lithium battery). M3 Pro Connect (black or white frame with lime trim) £549.99/£599.99. M1 (black or white frame with red trim) £499.99/£549.99. M1 DHC (black or white frame with red trim) RRP £549.99/£599.99. For more information, visit www.motocaddy.com.